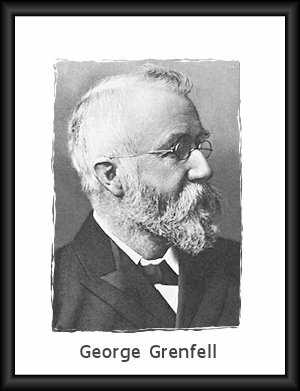 George Grenfell (1849-1906) was an English Baptist missionary and explorer to Africa. Labored for thirty-two years in Africa; the first three years in the Cameroons and the remaining years in the Congo. George Grenfell: A Light in Congo Darkness. Grenfell of the Congo. Short biography. George Grenfell married Mary Hawkes, Februrary 11, 1876 in Birmingham during his first short furlough in England. Having returned to Cameroons in May of that year, Mrs. Grenfell died in childbirth, January 10, 1877. In 1878, Grenfell married Rosana (Rose) Patience Edgerley, an African bride, who accompanied him in many of his most adventurous journeys. Their children included a son who died at 2 months of age and daughters Patience Elizabeth, Caroline Mary, Gertrude, Dorothy and Grace Isabel. Mrs. Grenfell died July 27, 1928, and is buried in May Pen Cemetery, Jamaica.